"Life is so unpredictable, my child." Amazon Studios has debuted the official trailer for the charming indie drama Photograph, the latest movie from one of my favorite directors - Ritesh Batra (of The Lunchbox, The Sense of an Ending, and Our Souls at Night). This first premiered at the Sundance Film Festival earlier this year, and it also showed at the Berlin Film Festival. Batra takes us back to India to tell a story of two strangers in Mumbai, Rafi and Miloni, who meet one day when Rafi decides to take her photo near the Gateway of India. At first he convinces her to pose as his fiancee to satisfy his grandmother's wishes, but the two develop a different relationship. I wrote a very nice review of this film at Sundance which is quoted in this trailer. It's a very light, but undeniably uplifting, soul-stirring film, showing how important connections can be. The film stars Nawazuddin Siddiqui, Sanya Malhotra, and Akash Sinha. Have a look below. From my review: "this film captures that tiny bit of connection between two people that is so vital to them even though it's not tangible in any way. And watching that, watching them connect, is truly heartwarming." Two lives intersect in Mumbai and go along together. A struggling street photographer, pressured to marry by his grandmother, convinces a shy stranger to pose as his fiancée. The pair develops a connection that transforms them both in ways that they could not expect. 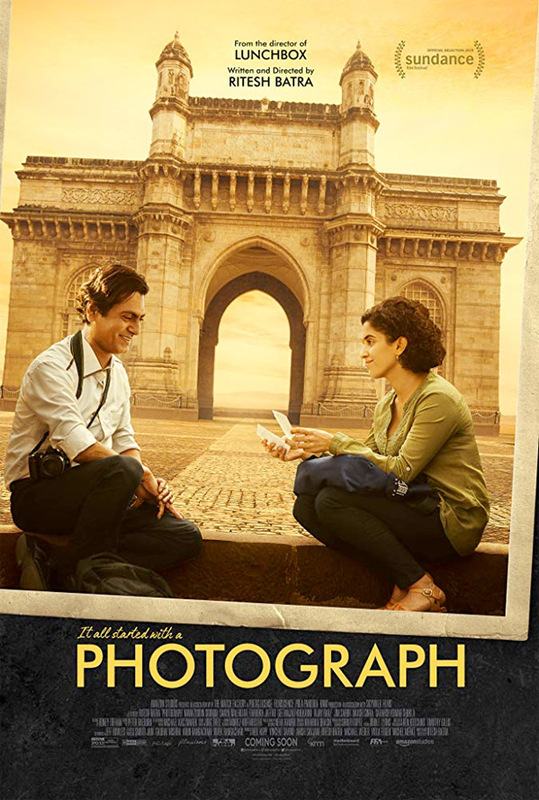 Photograph is directed by acclaimed Indian filmmaker Ritesh Batra, his latest film after directing The Lunchbox, The Sense of an Ending, and Our Souls at Night previously, as well as a few short films. This premiered at the Sundance Film Festival earlier this year (read our review), and also played at the Berlin Film Festival. Amazon Studios will release Batra's Photograph in select US theaters starting May 17th, 2019 coming up this summer. Who wants to see this?